Venue says Our celebrated breakfasts are served every day from 7am during the week and 8am on the weekend. 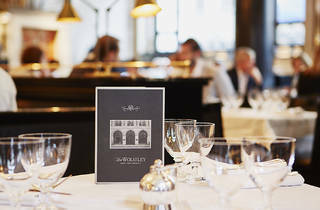 Like its stablemate Delaunay, a ‘café-restaurant in the grand European tradition’ and much-loved for its all-day menu providing something for everyone. 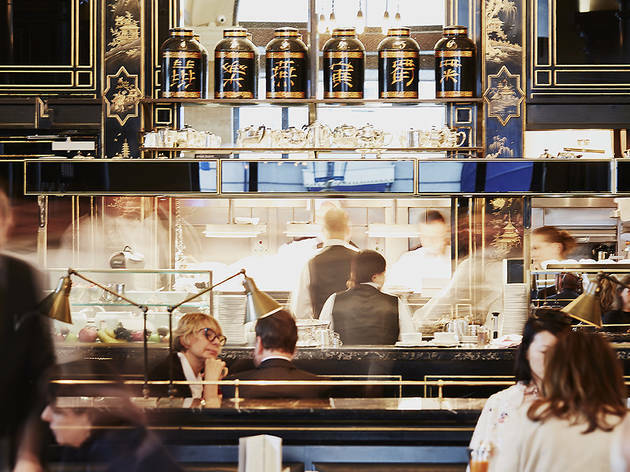 A self-proclaimed ‘café-restaurant in the grand European tradition’, the Wolseley combines London heritage and Viennese grandeur. 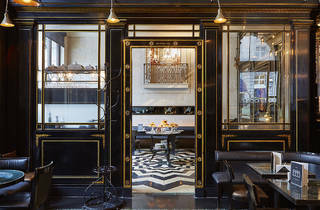 Its black, gold and cream colour scheme suggests prestige, and you might easily imagine the buzz of conversation and the chink of crockery to have reverberated around the high ceilings since the 1920s. Yet the venue is only a decade old. Nevertheless, it’s now firmly on many a London visitor’s checklist, alongside nearby bastion of tradition Fortnum & Mason. The kitchen is much-celebrated for its breakfasts, and the scope of the main menu is admirable. 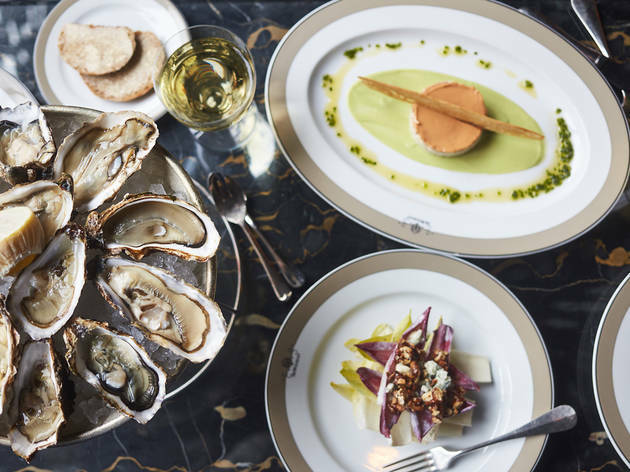 From oysters, steak tartare or soufflé suisse, via wiener schnitzel or grilled halibut with wilted spinach and béarnaise to tarte au citron or apple strudel, there’s something for everyone. On the Sunday afternoon of our visit, however, three-tiered afternoon tea stands were in abundance, enjoyed by a diverse mix of patrons: from Japanese businessmen to groups of female friends. Mini cakes and scones on the top tier are as English as the jam that accompanies them, while crustless finger sandwiches at the bottom are replenished by formal staff from a huge service team. Our waiter appeared a touch jaded, but he was certainly efficient, and dealt with complaints from the next table about weak coffee with grace. 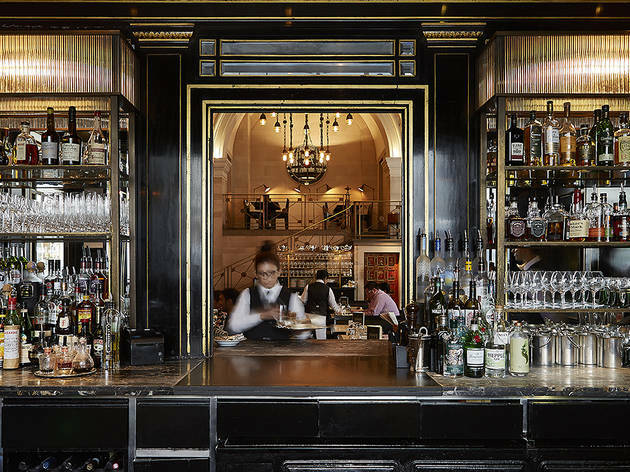 Combining British heritage with European grandeur, The Wolseley is one of London’s most admired all-day café-restaurants. 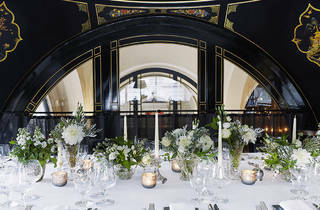 The Grade II listed building, coined ‘Piccadilly’s Shining Pearl’ during the Roaring Twenties, retains many features of its original design, such as the high vaulted ceiling, marble pillars, monochrome marble floor and hand-painted Japonais murals. Very much in the European Grand Café tradition, breakfast is arguably its most celebrated meal, served from 7am every weekday and a more leisurely 8am at the weekend. An eclectic variety of dishes follow from soups, sandwiches, seafood platters and salads to classics such as steak tartare, veal Holstein, grilled fish and the changing plats du jour. Open until midnight most days, a late-night menu offers an extensive selection of light snacks – ideal for those wanting a meal outside ‘normal’ restaurant hours, even if just for an omelette and glass of wine or a coffee and slice of cake. 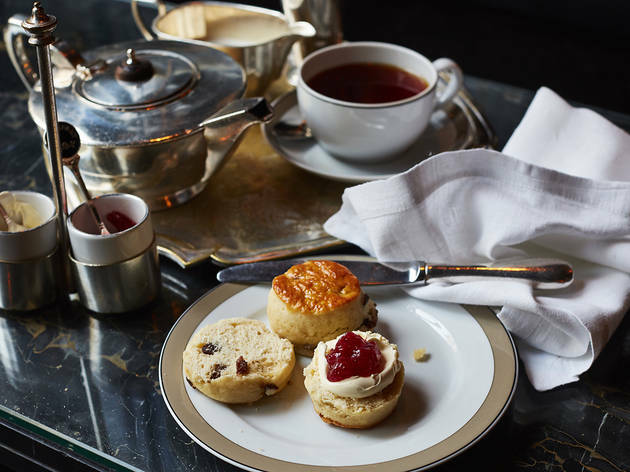 And for a truly British experience, opt for Afternoon Tea. 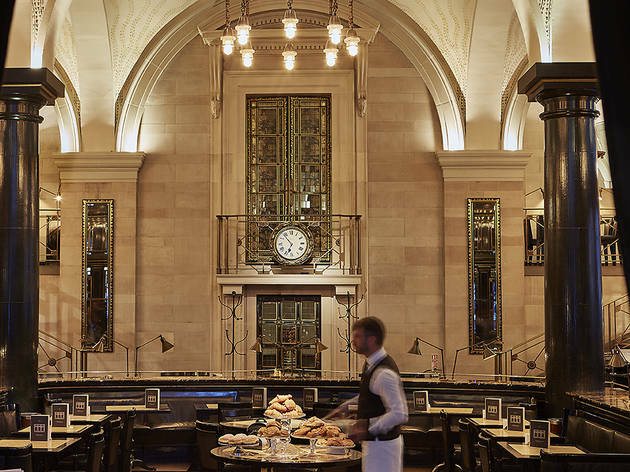 Known for its remarkably good value and served from 3pm Monday – Friday and from 3.30pm at the weekend, it offers an extensive selection of sweet and savoury sandwiches, scones and pastries; all handmade each day in The Wolseley kitchen. The grandiose interior is a must see in itself, lots of beautiful white marble and bourgeois decor. The afternoon tea is something to order, the amount of food is just enough - the fact that it wasn't an 'all-you-can-eat' service gave me an opportunity to enjoy the whole experience rather than focus on eating as many delicately sliced smoked salmon sandwiches and eclairs as i possibly could. 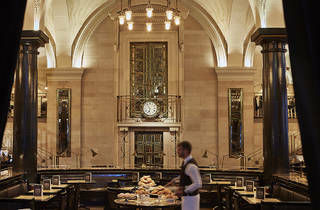 I'd visit The Wolseley again. Brunch at The Wolseley is one of those bucket list meals I’d always dreamed about undertaking and what better time to do it than when you’ve just got married! Booking it as a surprise for my new husband two days after we said ‘I do’ proved to be the perfect way to usher in breakfasting newlywed style. Staff were impeccable from the warm welcome to the prompt but understated table service and at 11am on a Monday, it was amazing to see the place was absolutely packed! Who are these people breakfasting at The Wolseley on a Monday and how can I become one them on a regular basis?! When it comes to making you feel special, it’s always the little touches that make the most impact - sincere ‘congratulations’ offered as we sat down were followed by a beautiful chocolate plaque reading the same. This sweet treat was delicious as was everything else we ate - a light, crispy & fluffy centred croissant accompanied by strawberry jam, lemon curd, orange marmalade and chocolate spread in individual brushed gold pots and Wolseley stalwarts, the Smoked Haddock Kedgeree and the Fish Cake with poached egg. Deeply and delicately flavoured, these two fish based plates were without questions some of the tastiest breakfast dishes I’ve ever had and the overall timeless elegance of the place only served to make every moment even more enjoyable. If it’s a special and memorable start to the day you’re after, I can’t think of anyone who wouldn’t enjoy spending it here and I cannot wait to go back for lunch, dinner and late night drinks. Value wise, sure it might be a touch more than your local brunch hotspot but it’s absolutely worth splurging on. This is such a quintessentially British restaurant, all the right sides of British pomp. I love going here, it’s like stepping back in time to the Art Deco age of London Town in the 1920’s. It’s fab and posh yet unpretentious but bloody classy. 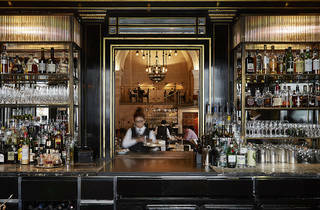 The Wolseley is open from morning until the wee small hours and is always buzzing with peppy atmosphere. The food is very good, I had the cote de boeuf and it was sublime. Reasonably priced for the sort of place it is, which makes it all the more appealing for repeat visits. The staff are impeccable and add to the vibrancy and ease of the place. Such a well-oiled machine this restaurant is. One of my favourite places to dine in London. Having waited such a long time to try this place, I took my parents here and I am still being made fun of for talking it up so much. Besides the classy atmosphere, yes they nailed it- the service is embarrassing. The food is average- no complaints but also NOT worth the hype whatsoever. If you want to feel special go to the Worsley. Breakfast, brunch, afternoon tea, dinner, cake - they do it all. The service is impeccable. The atmosphere makes you want to sit up straight, speak proper and make polite conversation. It feels like stepping into a lost world of unashamed luxury which is an incredibly lovely place to be for an afternoon. 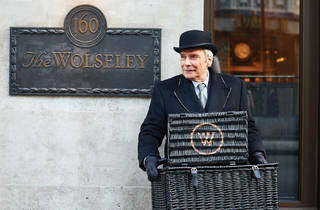 The Wolseley had long been a bucket list destination for me. It sounded like it would be the quintessential experience of a classic British afternoon tea, and the perfect location to farewell a friend seeking a final taste of London before returning to Australia. However our high hopes for our high tea were quickly dashed – service was chaotic and confused, the scones arrived cold and the treat selection was average at best. All in all, it felt like a very tired offering resting on its laurels, which is a shame given the hype (though I will admit I have not yet tried the brunch here). 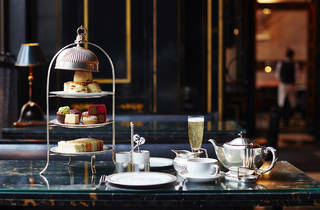 There are many better afternoon tea options in London which offer far more elegance, decadence and value for money. The perfect brunch for a special occasion. Everything here is not only served with a flourish but also perfection. Tea selection is brilliant and the menu leaves little to be desired. 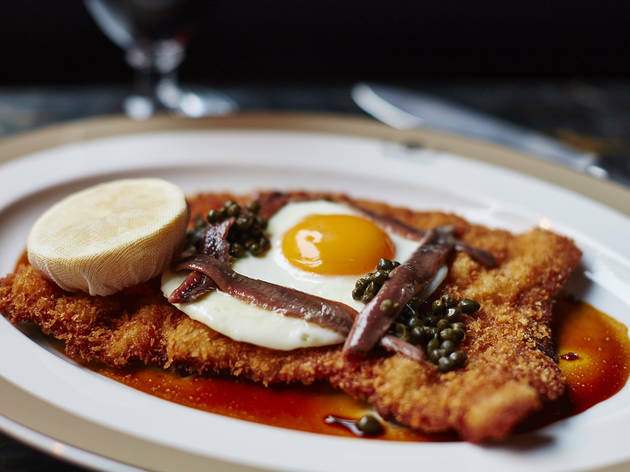 An all time classic, and rightly so: the Wolsely manages to combine style and tradition with a brilliant menu. Their breakfasts are famous and you can see why, the soft pastries, fluffy pancakes and crispy bacon are gorgeous. 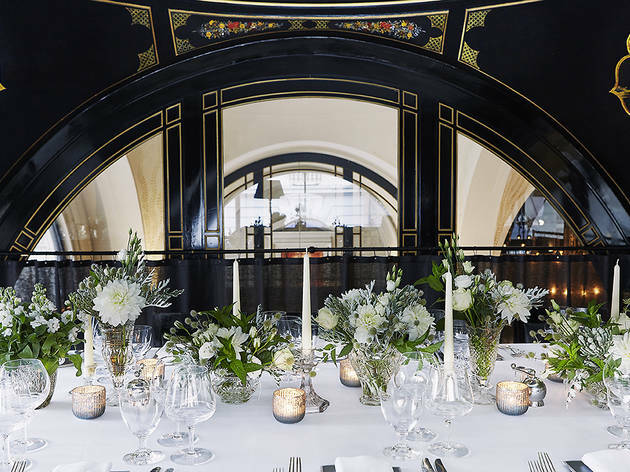 It's light and airy and makes you feel transported to a different era, and while the service may be silver it manages not to feel too stuffy. Ah so I'm a PR an allegedly we spend ALL our time here having avocado on toast for breakfast yah yah...but it's not just us! I visited for a 9am breakfast on a regular Tuesday and it was buzzing with Mayfair suits and lots of lovies. Next to Green Park and Fortnum and Mason, what better place to start your day? Why did I like it? Because they were elegant, no stuffy receptions here. No reservation? No problem just wait in the bar. The decor is pretty and chic with loose tea served up in large silver pots with refined delicate tea cups. The menu is full of tasty treats including the usual Eggs Benedict, Smoked Salmon and Scrambled Eggs (which I had) and lots of options for mixing and matching so you can ensure you get that hit of avocado ;-) Mains are around £15 with smaller dishes around £7 and I had a little too much food to get through...but I guess this is a good problem. All in all, good service, fab location and busy, busy, busy. My friend and I shared the Eggs Royale, which had the fluffiest English muffin I've tasted. The quality of the salmon was top and as someone who is quite picky about hollandaise sauce, The Wolseley's really hit the spot. I would definitely recommend getting one of their pastries, as they are amazing. I had the Pain aux Raisins, which took me straight back to a Parisian boulangerie with every bite! Heavenly afternoon tea... The Wolseley did not disappoint. Can't fault the food at all, it was amazing, but the atmosphere was a little loud for a relaxing afternoon treat. A truly London experience. Once you walk in through the doors, you find yourself in a different world and forget about the chaos of Piccadilly. All the details from the teapot to the napkins and the food quality was impeccable and the service was very helpful. I ordered the Rosti with fried egg .. The rosti was a fancier version of what you would get in Austria or Switzerland. The fried egg was delicious. Hard to get a table even on the early hours of the morning but still worth a try. 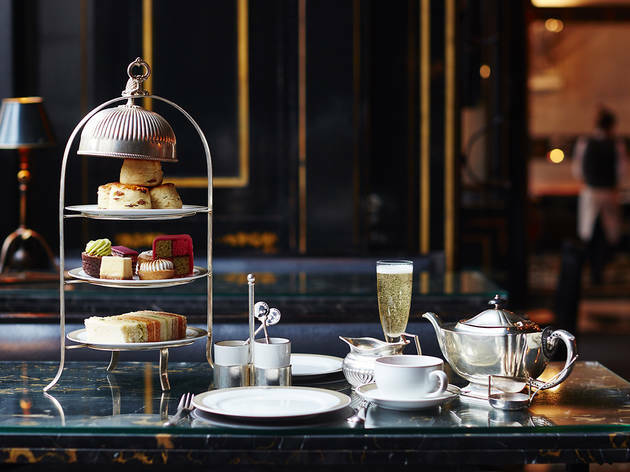 You can't get much more classic than afternoon tea at the Wolseley. Although the service is often quite slow, the selection of sandwiches, cakes, teas (and champagne if you fancy it) is wonderful and the setting is idyllic. 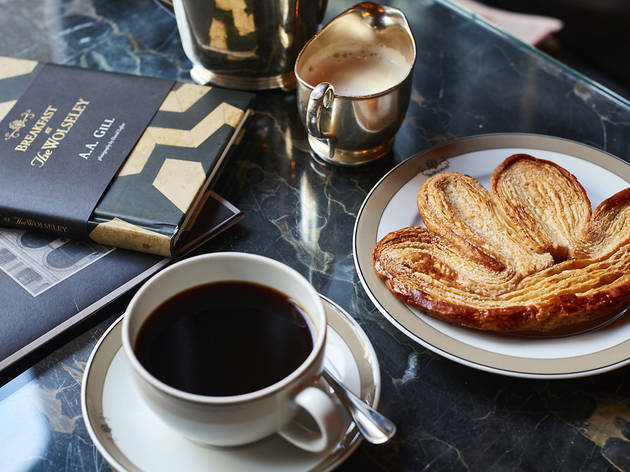 Breakfast at The Wolseley is a London institution, and rightly so: the service, food and surroundings here are virtually faultless. The main room was once a car showroom and a bank too, meaning there's a lot to look at – the flooring is particularly spectacular. Beyond this, it's impossible to go wrong when choosing something from the menu. The most famous dish is eggs benedict, and this is everything you'd expect: creamy sauce, runny egg yolk, perfectly toasted muffin. But the full English is also outstanding, as are the crispy pastries. 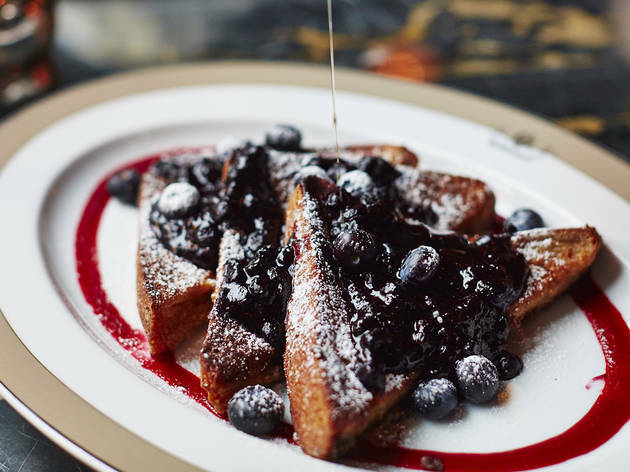 Perhaps the best thing about breakfast at The Wolseley is the price: it's not exactly cheap, but you'll end up spending about as much as you would on an average dinner, making it perfectly affordable. 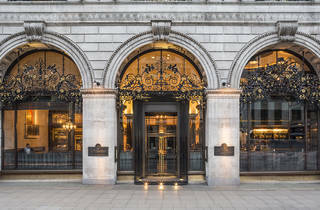 The Wolseley instantly makes you feel like the elite in London, and not for as much as you might imagine! We booked a table for breakfast but they do accept walk ins and it didn't look like it was too difficult to get a table, particularly mid week I imagine. Our experience was perfection from the very beginning when greeted by the fabulous staff to the last refill of our water glasses two hours later. The main breakfast/dinning room is pure class and one of my favourite people watching spots in London to date, beautifully decorated in a very classic manner. Emphasis is put on enjoying yourself and relaxing as we were not rushed in the slightest. I adored the silverware and the presentation of the food was excellent. The Gruyere omelette was divine but do not underestimate the bacon roll with a fried egg on top, the perfect breakfast. The bill was under £35 for two coffees, two breakfasts and a large pot of green tea which we found excellent, also you can't put a price on the overall fabulous experience. With polite staff and lots to look at, not to mention the excellent food, everyone should order some Wolseley treatment now and again! I was so chuffed to be able to get a table on spec this week. In fact I learnt they keep an area for walk ins! The guy on the phone & the one who greeted us were each lovely! The place is beautiful, sadly the unreserved area is not in the main buzz & grandeur of the dining room but it was still impressive. Without a doubt it's a pricey place. We had a couple of starters to share btw 4, a main each, wine & some after dinner drinks & I think (it had been a long & heavy day) our bill was in excess of £50 each so the full works would get you near £100 a head I'd say! But the dishes were lovely & the service faultless. No snootiness or idea that we weren't the 'regular' types. I'd definitely go again - casually or for a blow out! 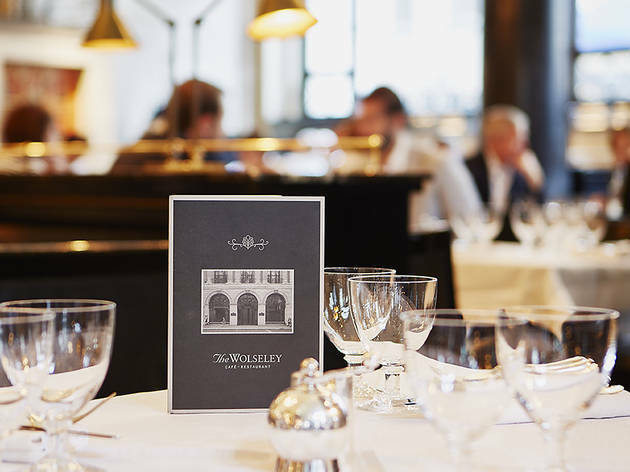 Known throughout London as a temple for classic European fine dining, The Wolseley is everything you would expect and more. With an eclectic menu, from traditional dishes such as liver and onions, to more exotic tastes such as Kashmiri lamb curry, there is a dish for everyone, yet rest assured, every dish is cooked with excellence, bursting with flavour and demonstrating the skills of the highly trained chefs. The scallops with cauliflower puree and a raisin and pine nut dressing (which can be ordered in a small or a large portion) were perfectly cooked; tender and sweet. The no-fuss veal schnitzel is also a standout dish and if you pair it with one of their delicious sides such as broccoli with parmesan or creamed Brussels sprouts (honestly, the tastiest thing on the table! ), you will not be disappointed! And to round it off, you can indulge in their sumptuous dessert menu or select from their freshly baked patisserie section; the lemon meringue tart is tangy, soft and all the right types of chewy. What is great about The Wolseley is that it provides incredible food for everyone- its all day menu appeals to tourists in their raincoats with shopping bags, to families dining for a special occasion, even to the A-listers- (I was seated a few feet away from Emma Watson which was one of the most exciting moments of my life. Period.). 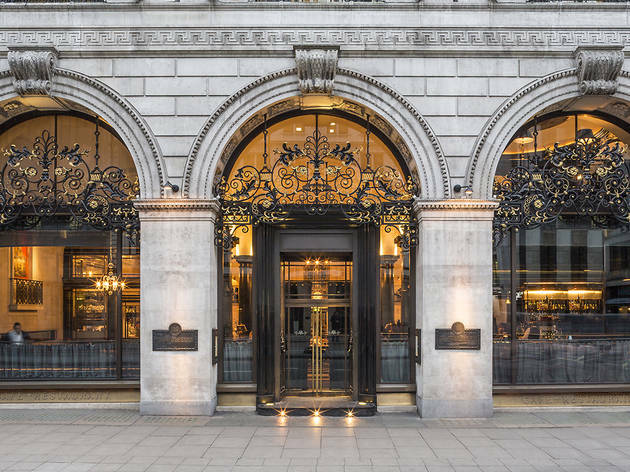 If you are wanting to celebrate an occasion with a glamorous dinner or fancy an afternoon tea with style, The Wolseley, although a little pricier than your usual fare, is worth every extra penny. You should not miss this classic British spot in London whether you are tourist or a local! The place itself i(a former bank) is beautiful and impressive with its high ceilings, marble floor and beautiful interior. 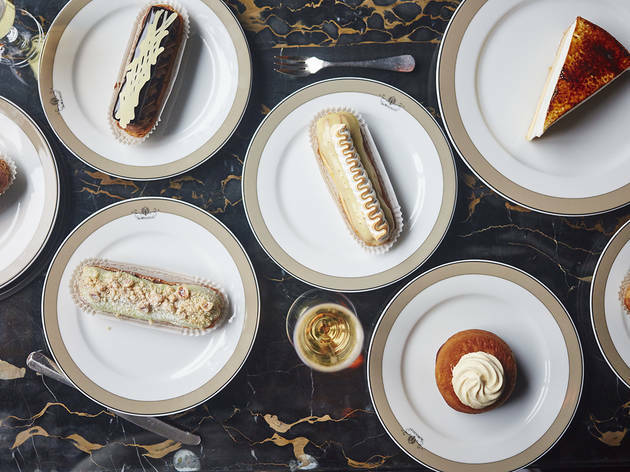 The Wolseley is one of the best place in London for Afternoon tea and the menu offers different options whether you want to go for the cream tea or the full treat. Service is friendly and very professional. A very good address in London. Beware: diners are allotted 1½ hours for a meal and whether you are finished or not you'll be thrown out. That happened to us at lunch and we had to leave even though we still had a third of a bottle of wine left (a £42 bottle of Morgon!) and had yet to order our desserts. This, despite them taking 20 minutes to seat us even though we had reservations. They seem more interested in getting people out to make way for high-volume, fast throughput teas aimed at tourists (presumably they offer higher margins). It isn't what it used to be. Shame. Another restaurant to cross off the list. 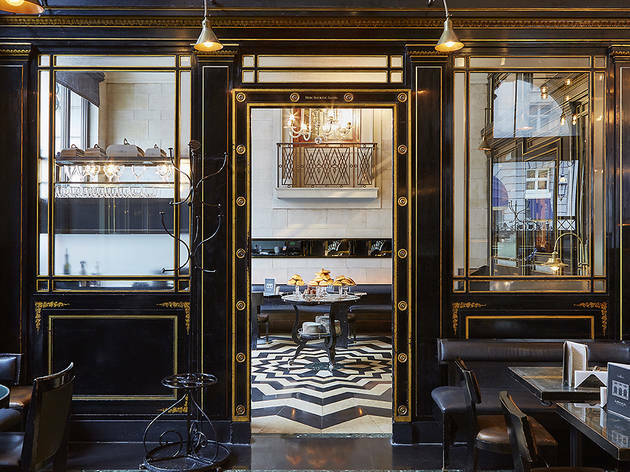 The Wolseley is everything you expect it be: beautiful interiors, impeccable service and classic food served exceptionally well. I agree that it is a great place to take visitors to the city, but also excellent for a professional lunch or a weekend brunch. Highly recommended. Impressive breakfast spot for visitors and Londoners alike. Early morning slots and online booking makes it easy to get a table but I've often turned up with out a reservation and managed to get a spot. The staff are impeccable and the attention to detail outstanding. It real is a grand cafe in the truest sense. A gem of a place and great place to take visitors when in London. The decor is grand and looks prestigious with black and gold touches in its details and menu. They serve meals all times of the day. It is a place where simple dishes are amazing when done nicely. The building is lovely, but the food and the atmosphere left me a little cold. The scones were outstanding, but the rest of the food didn’t quite hit the mark as the sandwiches weren’t particularly tasty or interesting and the deserts, although pretty, didn’t taste as good as they looked. The champagne was very nice though. I also felt like the venue was too crowded and was far too noisy for an afternoon tea. 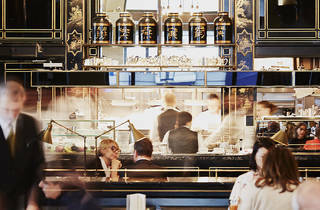 The Wolseley is one of my favourite restaurants. I've been for brunch, lunch and dinner and can recommend all of them. It's great for people watching, and despite being a huge room the atmosphere is good. The food has been delicious every time and eggs florentine are some of the best I've had. It's also a really fun place for cocktails. If you haven't already, go! The Wolseley is one of my favourites. I must admit, i've always had a soft spot for this dining locale. 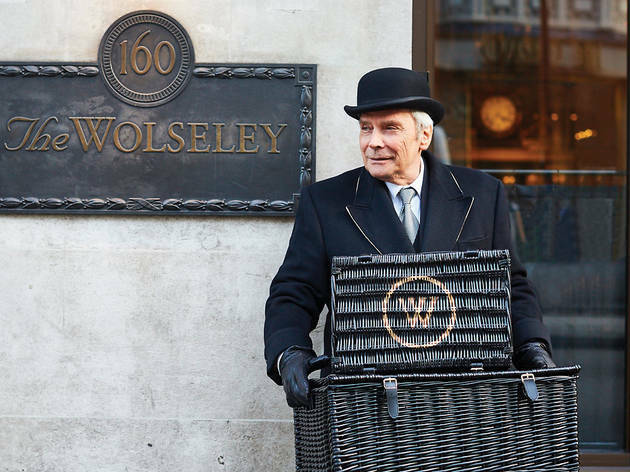 The service is impeccable, especially in comparison to many other places around London; i think what The Wolseley stands for, in terms of dining in London is great. The food has always been enjoyable. Their battenberg is in fact my favourite thing on the menu, to be enjoyed with a macchiato of course. Though, as expected the starters are 'small', i definitely thing you get enough food and i remember we ordered far too much the first time we went as we expected far less. I admire anywhere where the food tastes fresh. One of my favourite places to go for a treat, I always recommend it to people. The interior is elegant with high ceilings and marble, and the service is great. The afternoon tea is lovely. The price is just right for the quality that you are in store for. Sandwiches, scones, cakes, all great! The Wolseley blend tea is also delicious. I had been postponing dining at The Wolseley, waiting for a special occasion. I finally went for dinner last night and I don't think I have ever been so disappointed for a restaurant that is so well known and recognized. The food really does not live up to its expectations, it was not fresh and it felt like it was mass produced. I compare it to being in a big cruise ship, where the atmosphere is nice but food has to be pre-prepared and cooked for 1000's of people, so it has to compromise on quality and freshness. Having been to many restaurants in London, I can think of hundred better places to spend more than 100 pounds on a dinner. In addition, I left a shopping bag under my table and called the restaurant next day and a very unhelpful lady said they had found nothing and hanged up the phone. At least, I won't be making the same mistake again. I agree with other comments. The evening food I had the other day was quite disgraceful. I regret not having the courage to send my dish back. Still a fantastic place for afternoon tea though. Having only been to the Wolsley once (and having been hugely disappointed the first time), I trusted that my second visit would remove any doubt in my mind that this was to be one of London's finer restaurants. Where do I begin… Having seated my party of 8 on two different tables (again), 5 were served soup for starter which, if the menu had not stated otherwise, I would have assumed to be a discoloured salt water. While I can cope with slightly salty food, this was somewhat vulgar, and the dry bread helped very little. Not 1 of the 5 could stomach it. My main, a “rare” fillet came out without the slightest hint of pink, which I was then told by two waiters was rare and that I was in fact wrong to claim otherwise. Eventually, having finally spoken to the Manager, I received a nicely rare steak which, second time round, was actually very nice. My companions were however less fortunate than me. Having complained about the starters, they were in no mind to stir up a fuss over their own mains, but to the last, each was highly disappointed. Three had opted for a beef sandwich which looked like it was fresh out of a tin and highly unappetising. Needless to say we did not hang around for desert, but sadly the food was not actually my biggest problem. The rudeness of seemingly every member of staff was outrageous. I believe the term, ‘the customer is always right’ had been misconstrued, and a simple apology over the travesty of a dish they served for starter and main was too much to ask for. I will never return. Had a farewell late lunch here on 30 Jan, great service, seperate veggie menu and lovely bottle of wine. Would defintely go back. I agree completely with previous comments. I took my mum for Afternoon Tea at the Wolseley's and both of us couldn't have been more disappointed. The food was very average and certainly not worth the money. The service was appalling and rude. The building itself is nice but there's nothing relaxing about the experience - it's overcrowded and stressful. Needless to say that we will not be going back. Overpriced and massively overrated. Food has been poor every time I've visited, both at breakfast and dinner. Cold eggs benedict is unforgiveable at these prices, and the other dishes I've eaten there are completely unmemorable. The 'experience' isnt particularly impressive either, with service generally being scatty and inconsistent whenever I've visited. The room is nice. That's about the only positive thing I can say about it. Don't get what all the fuss is about, sorry. Nothing relaxing about our dinner here this evening - they did not hide the fact that they wanted our table back as quickly as possible - service impersonal and peremptory, verging on rude. Will not hurry back .